The Food and Drug Administration approved the first vaccine developed to protect women against cervical cancer. This vaccine is known as Gardasil, the drug is highly effective against four types of human papillomavirus, including two that cause cervical cancer. Since then there is another vaccine also has been approved for same disease called Cervarix. The Center for Disease Control and Prevention’s Advisory Committee on Immunization has recommended that the vaccination series be given routinely to girls aged 11 to12. It also noted that the series can be given to girls as early as 9 years of age at the discretion of physicians, and to girls and women who are 13 to 26 years old. The vaccine should be administered before the onset of sexual activity (before women are exposed to the virus), but women who are sexually active may still be vaccinated. The vaccine will cost $140 per dose and protection will require three doses over 6 months. In contrast, women’s and public health groups support early and mandatory vaccinations. HPV is the most common sexually transmitted infection in the United States. Currently, more than 20 million men and women in the United States are infected with HPV, and more than 6 million are estimated to become infected each year. HPV is most common in young women and men in their late teens and early 20s. By age 50, at least 80 percent of sexually active women will have acquired HPV infection. How serious is disease caused by HPV? 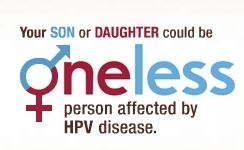 HPV infection can lead to cervical cancer in women as well as to other cancers that can affect males or females. Cervical cancer is diagnosed in more than 9,700 women each year in the United States each year and causes 3,700 deaths. Seventy percent of cervical cancers are caused by strains of HPV included in the newly licensed HPV vaccine. HPV also causes genital warts in men and women.